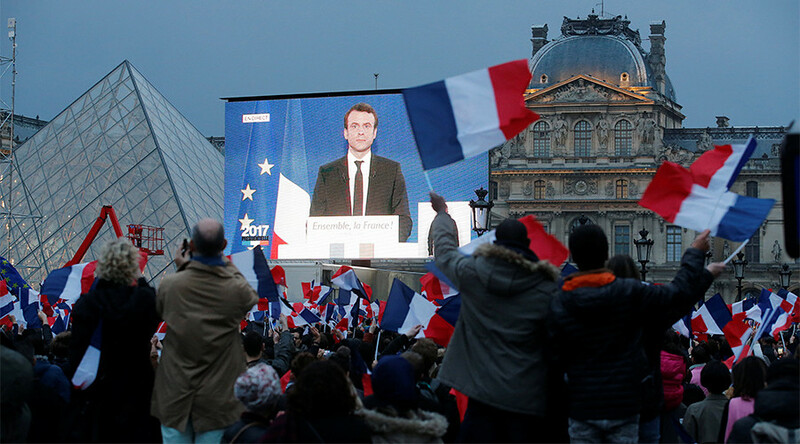 Ever since the 1970s, French presidents have been elected with a certain amount of hope for renewal, but their careers have ended in failure, says John Laughland, Institute of Democracy and Cooperation. Other analysts also joined the discussion. Emmanuel Macron, 39, emerged victorious in the campaign for the French presidency, but already a chorus of critics are questioning many aspects about the leader of the En Marche! party. Macron, who has been described as a centrist, pulled 66.1 percent of the vote, delivering a resounding defeat to the far-right candidate and leader of National Front, Marine Le Pen, who gained just 33.9 percent of the votes. However, the numbers fail to tell the whole story, as many French citizens refused to participate in the election, or opted for the "least of two evils" scenario. RT spoke with a number of analysts and politicians for their views on what France may expect under the leadership of Emmanuel Macron. RT: Will Macron try to change France’s relationship with the EU? JL: Successive French presidents have been saying this now for generations. Balzac, the great French novelist, said, “The French love to elect a new government providing it’s the same as the old one.” I’m afraid that’s what we’ve seen today. You have to go back a very long time in French history, to the 1970s - several generations - to find a government and a president who succeeds in getting himself reelected. Ever since the 1970s, all presidents, without exception, have been elected with a certain amount of hope for change, renewal, and all the rest of it, and their careers have ended in failure – either because they’ve failed to be reelected, or because a hostile majority has been elected against them in the legislative elections… I see no reason why this should now change under Macron. RT: What is Germany’s influence over France? JL: Ever since the creation of the single currency, the euro, Germany has become the hegemonic power in Europe. France, which back in the 1990’s gambled that the euro would somehow dilute German power, has lost its bet. Far from diluting it, it’s increased it. Ever since the single currency was created, therefore, France has been the junior partner in the Franco-German couple. All European questions are now referred to Angela Merkel … And that will only continue; indeed, it will be aggravated in my view by the departure of Britain from the EU. RT: Can Emmanuel Macron unite a country where more than half of the electorate didn’t vote for him? JC: Well, more than 25 percent of the electorate abstained, and there were nine percent null votes, which is entirely new in a French presidential election. So [Macron] won in an apparent landslide (65.8 percent). But in fact, he got less than half of the voters, while 61 percent do not him to have a majority in the new legislative assembly. So it's a very unstable situation. The whole thing – let’s say the truth - from the beginning is a setup. Since April 6, 2016, when En Marche! was launched, a young, clever and competent banker was promoted against a repulsive Marine Le Pen. The debate proved it: she was aggressive, incompetent. He appeared as intelligent and above everything. So he won, but it is a setup. It is something that has been arranged by the French establishment to succeed to Hollande with a kind of new face – it is Hollande with a new face. RT: What does Macron’s victory mean for France? LJ: Yes, it is a very sad for us and a very sad day for France, because, as you probably know, Francois Hollande was very unpopular in France. Only 10 percent of French citizens were supporting him. But the bad news is that tonight he has been reelected – not him really, but his lookalike, Mr. Macron, to carry on the same politics, which is a disaster: uncontrolled globalization; uncontrolled mass migration; privatization of social security. In other words, very bad news for France. Macron is the establishment … He is a new brand for a very old product: More EU, more immigration, more globalization. RT: How would you describe Marine Le Pen’s performance in the election? LJ: 11 million French voters did vote for Mrs. Le Pen, which is amazing when you see how much the media were against her; how many lies were told about her. As you know we’re no longer in a real democracy today, because they try to tell us what to do when we go to vote. It is a real resistance act to vote for Marine Le Pen. RT: What are the prospects for Emmanuel Macron establishing a new political paradigm for France? LR: The European policies dictated by Germany, and he [Macron] has declared that he is pro-European. One of the first who congratulated him was Mrs. Merkel, and also Mr. [Jean-Claude] Juncker. So it’s an indication. There is a great relief in the European circles that European policies will continue as before. He is the candidate of continuation. It he will really be under the influence of Mrs. Merkel, no doubt about that.